If you live in Monterey County, you know the area gets a fair share of sun every year, reaching upwards of 260-plus days. Residents and business owners in Salinas, Seaside, Monterey, Soledad, Marina, and more have a great opportunity to take advantage of a renewable energy resource: the sun. If you’re considering installing solar panels on your home or business, give West Coast Solar a call today to get started! AS technology advances, renewable energy continues to come out as the frontrunner in the sustainable energy production and consumption option. Traditional energy production processes cause a significant amount of carbon-emission, which pollutes the environment. Renewable energy sources like solar power produce little to no pollutants. You can save money on your utility bill and help the environment when you make the switch to solar power. Across the entire nation, homeowners are making the decision to go green. They’re installing solar panels and systems on their homes to reap the benefits of energy independence. Solar is a long-term investment that pays off in a variety of ways. Not only does it help the environment, but it also reduces your utility bills. 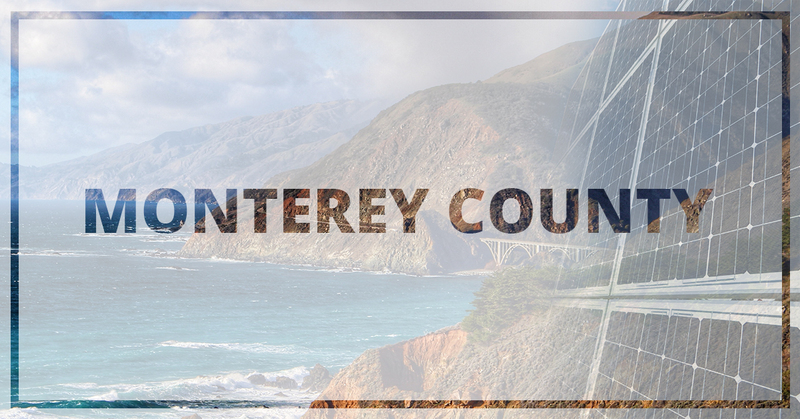 Monterey County businesses have never had a better opportunity to produce their own clean energy. Even if you aren’t able to install solar panels on your own business, you can look for a Power Purchase Agreement (PPA) with another business to purchase clean energy. You will save money based on lower energy rates and help preserve the environment in the process. Monterey County is known to residents and business owners as California’s “Cradle of History” for the many firsts that occurred in the area. Why not create more history and tradition with renewable energy. Lead the way as the entire world discovers the benefits of solar power. Give West Coast Solar a call today if you’re ready to install solar panels on your home or business.